If your industry requires corrosion resistance in its equipment, piping or ductwork, then you understand the need to have a material that stands up to those conditions for the long term. Failure means lost production, and that costs you and your company money, not to mention time, headaches and the potential for serious safety concerns. You also understand the costs of highly specialized metal alloys, such as Titanium or Hastelloy, designed for these corrosive conditions. Dual-Laminate can provide a cost effective alternative. Dual-Laminate technology is recognized as significantly improving the service life of plastics used for equipment requiring corrosion resistance, making it a reliable and economical alternative to high cost metal alloys. The corrosion resistant inner liners are structurally reinforced with an outer shell of fiberglass, allowing for a relatively light weight but structurally very solid construction. The flexibility of construction methods allows precise molds to be made of the plastics, making them ideal for custom products such as storage vessels, sump covers, tower tops, washer hoods, ducts and scrubbers. Dual-laminates are significantly more stable and reliable, and have a longer life, than using synthetic veils, double corrosion barriers, or the best of fiberglass reinforced resins alone. Dual-laminates can be constructed in a variety of thermoplastic materials, with selection dictated by the chemical and service requirements. 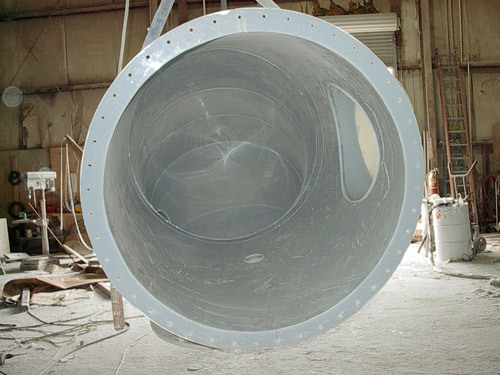 Combining the corrosion resistance of the thermoplastic liners with the lower cost, strength and durability of a Fiberglass Reinforced Plastics (FRP), will provide your process many years of reliable service, comparable to the best high end metals, while saving you money and giving you peace of mind. Let B&D Plastics provide you with a quote for your unique application, and see how much you could save. Our machine-made thermoplastic sheets are uniform, and have known chemical resistant properties to meet your toughest corrosive environment. 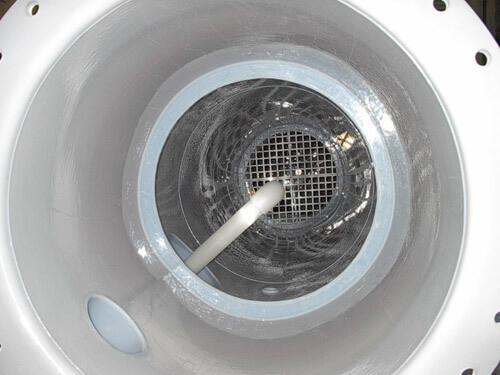 B&D Plastics has a unique, thermo-forming molding processes for corner radius and dished head designs assures you of the integrity of the liner in key stress points. 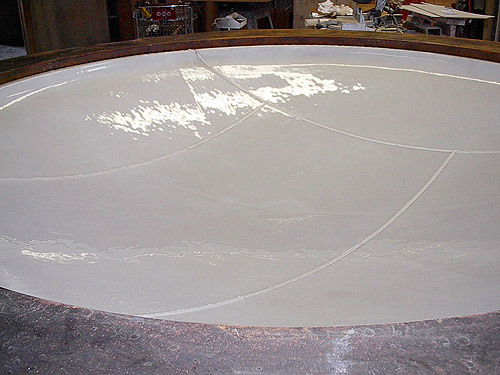 The advanced bonding technology used by B&D provides a stronger bond between the thermoplastic and the fiberglass structural shell than is possible with lined metal alloys. The thermal expansion coefficient of the FRP/Thermoplastic laminates is much lower than with lined steel or lined tile, making for a more stable, durable bond and longer life with lower maintenance. Dual-laminate techniques allow use of TQM processes, such as spark testing of all welds to assure the highest quality in the finished product. 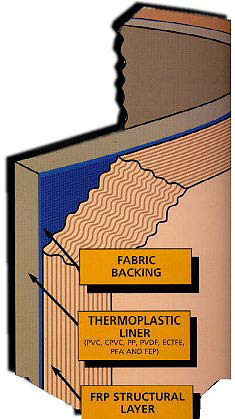 With dual-laminates, you can monitor the integrity of the liner throughout the life of your vessel. Spark testing can be done periodically to determine the integrity of the liner, and to identify and isolate the areas of concern. Then field repairs or modifications can be made during scheduled downtime, greatly extending the life of your vessel at a fraction of the cost for a new vessel. For the continuity of your process, for production and for the greater safety of your operating personnel, this feature alone will give you great peace of mind. For more information on our products and services, please contact us today!